↑ 1.0 1.1 1.2 "How effective is Isis compared with the Iraqi army and Kurdish peshmerga?". The Guardian. 12 June 2014. ↑ "Sunni insurgents form alliance against US". The Guardian. 12 October 2007. Retrieved 31 March 2016. ↑ "استنفار بمدن عراقية واستمرار المعارك بالأنبار" (in อาหรับ). Al Jazeera. 5 January 2014. ↑ Eric Schmitt and Alissa J. Rubin. "U.S. and Iraqis Try to Fragment Extremist Group". The New York Times. The New York Times. สืบค้นเมื่อ 13 July 2014. ↑ Jaish al-Rashideen's logo is visible alongside other insurgent groups in this image uploaded to a pro-insurgent Facebook page in December 2014: . Retrieved January 4, 2015. ↑ Islamic Front for the Iraqi Resistance's logo is visible alongside other those of other insurgent groups in this image uploaded to a pro-insurgent Facebook page in December 2014: . Retrieved January 4, 2015. ↑ 8.0 8.1 Category: POLITICS (2014-07-23). "Baath in Iraq declares war on ISIS". English.shafaaq.com. สืบค้นเมื่อ 2014-08-22. ↑ Hassan, Hassan (17 June 2014). "More Than ISIS, Iraq's Sunni Insurgency". Carnegie Endowment for International Peace. สืบค้นเมื่อ 20 June 2014. ↑ "Military council of the rebels starts setting governors on their captured cities". Elaph. Osama Mahdi. สืบค้นเมื่อ 13 June 2014. ↑ 11.0 11.1 "How Syria's civil war is spilling over - Middle East". Al Jazeera English. สืบค้นเมื่อ 2014-08-19. ↑ "Sunni Opposition to the Islamic State". Middle East Review of International Affairs. 28 September 2014. Retrieved 30 September 2014. 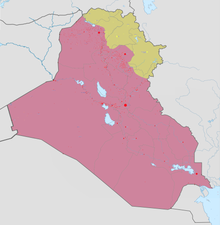 ↑ "5,000 Sunni Militiamen Fighting Alongside the Iraqi Security Forces". 4 March 2015. สืบค้นเมื่อ 18 March 2015. ↑ Tomlinson, Hugh. "Iran's special forces rush in to help floundering ally". The Times. สืบค้นเมื่อ 11 June 2014. "BBC News - Iraqi PM welcomes Syria air strike on border crossing". Bbc.com. 2014-06-26. สืบค้นเมื่อ 2014-07-31. ↑ 16.0 16.1 "Obama Enlists 9 Allies to Help in the Battle Against ISIS". The New York Times. 6 September 2014. ↑ 17.0 17.1 "US announces coalition to fight Islamic State". Al Jazeera English. 6 September 2014. ↑ 18.0 18.1 Adam Vidler. "Australia to take up military role in Iraq conflict". สืบค้นเมื่อ 2014-08-31. ↑ 19.0 19.1 19.2 19.3 "Seven Countries to sell weapons to Kurds". BasNews. 14 August 2014. สืบค้นเมื่อ 24 August 2014. ↑ 21.0 21.1 "Iraq crisis: Barack Obama sends in US troops as Isis insurgency worsens". The Guardian. 17 June 2014. ↑ 22.0 22.1 "Obama authorises airstrikes in Iraq". The New Zealand Herald. สืบค้นเมื่อ 8 August 2014. ↑ "BBC News - Iraqi PM welcomes Syria air strike on border crossing". Bbc.com. 2014-06-26. สืบค้นเมื่อ 2014-07-31. ↑ "Iraqi PM Nouri Maliki: Russian jets will turn tide". BBC. 26 June 2014. ↑ 25.0 25.1 "Albania sending weapons to Kurdish forces in Iraq". NOW News. 28 August 2014. สืบค้นเมื่อ 28 August 2014. ↑ 26.0 26.1 Klix.ba. "BiH ce Iraku donirati više od 15 miliona metaka za borbu protiv IDIL-a". klix.ba (In Bosnian). Bosnia and Herzegovina. สืบค้นเมื่อ 6 January 2015. ↑ 28.0 28.1 "Iraq crisis: Britain ready to arm Kurds as EU meets – live updates". The Guardian. สืบค้นเมื่อ 15 August 2014. ↑ 29.0 29.1 "Estonia donates small-arms ammo to Iraqi Kurds". 2 September 2014. สืบค้นเมื่อ 3 September 2014. ↑ 30.0 30.1 "Hungary to send ammunitions to Iraq". Politics.hu. สืบค้นเมื่อ 14 October 2014. ↑ "التركمان يشاركون في معركة تحرير تكريت بلواء من 4 آلاف مقاتل". Almada. 23 March 2015. Retrieved 3 June 2016. ↑ "Ankara plays favorites with Iraqi, Syrian Turkmens". Al-Monitor. 19 January 2016. Retrieved 30 March 2016. ↑ 34.0 34.1 34.2 34.3 34.4 "YNK: PKK and YPG are fighting in Şengal and Rabia against ISIS". 6 August 2014. สืบค้นเมื่อ 6 August 2014. ↑ 35.0 35.1 35.2 "Kurdish PKK Forces Gather to Retake Mahmur Camp and Shingal". Kurdistan Tribute. 8 August 2014. สืบค้นเมื่อ 9 August 2014. ↑ "IS-Terror in Shingal: Wer kämpft gegen wen? Ein Überblick". Êzidî Press. 12 October 2014. Retrieved 17 November 2014. ↑ "Video: YPG and MFS arrived in Shingal Mountains Sinjar to protect the refugees who fled from Shingal and other Towns News by Suroyo TV 4.8.2014 Western Dialect Source Suroyo TV ~ Frequency". Frequency.com. สืบค้นเมื่อ 2014-08-19. ↑ "Christians in Iraq Forming Militia to Defend, and Possibly Retake, Ancestral Lands". Site. ↑ Motlagh, Jason. "Iraqi Christians under threat yet again". Gulf News. สืบค้นเมื่อ 11 August 2014. ↑ "Dwekh Nawsha- An Assyrian Fighting Force in Iraq". Aymenn Jawad al-Tamimi. 6 November 2014. Retrieved 7 November 2014. ↑ "International Training Mission Begins for Forces in Northern Iraq". Germany.info. 18 February 2015. ↑ "Two US fighter jets strike ISIS artillery in Iraq's Kurdistan - Pentagon". Russia Today. 8 August 2014. ↑ "Iranian Forces Fight Alongside Peshmerga In Jalawla". BasNews. 17 August 2014. สืบค้นเมื่อ 17 August 2014. ↑ "Iranˈs humanitarian aid to Iraqi Kurdistan region delivered". Reliefweb. 7 August 2014. สืบค้นเมื่อ 16 August 2014. ↑ Chastain, Mary (January 28, 2016). "Russia Equipped Iraqi Kurds with Weapons to Combat Islamic State". Breitbart. ↑ "Military Skill and Terrorist Technique Fuel Success of ISIS". New York Times. 27 August 2014. สืบค้นเมื่อ 21 October 2014. ↑ Matt Bradley and Ghassan Adnan in Baghdad, and Felicia Schwartz in Washington (10 November 2014). "Coalition Airstrikes Targeted Islamic State Leaders Near Mosul". WSJ. ↑ "The Islamic State of Iraq and Greater Syria: A Primer". The Soufan Group. 13 June 2014. สืบค้นเมื่อ 23 October 2014. ↑ "Half of I.S. chiefs are wiped out in air raids". 2 February 2015. สืบค้นเมื่อ 10 August 2016. ↑ "Islamic State leader in Iraq's Anbar killed, Pentagon says". BBC News. ↑ "Iraqi security forces arrest Shiite militia leader". The Daily Star. สืบค้นเมื่อ 2 January 2014. ↑ "Islamic State 'has 50,000 fighters in Syria'". Al Jazeera. 19 August 2014. สืบค้นเมื่อ 19 August 2014. ↑ "ISIS has 100,000 fighters, growing fast – Iraqi govt adviser". RT. สืบค้นเมื่อ 2 October 2014. ↑ "ISIS militants have army of 200,000, claims senior Kurdish leader". El-balad.com. สืบค้นเมื่อ 16 November 2014. ↑ Colin Freeman (18 May 2013). "Izzat Ibrahim al-Douri: the King of Clubs is back, and he may yet prove to be Saddam Hussein's trump card". The Telegraph. ↑ Daniel Cassman. "Islamic Army in Iraq | Mapping Militant Organizations". Stanford.edu. สืบค้นเมื่อ 2012-09-14. ↑ Heras, Nicholas A. "The Tribal Component of Iraq's Sunni Rebellion: The General Military Council for Iraqi Revolutionaries". The Jamestown Foundation. สืบค้นเมื่อ 12 September 2014. ↑ usatoday.com (October 9, 2012). "Al-Qaeda making comeback in Iraq, officials say". Qassim Abdul-Zahra, Associated Press. ↑ Collins, Chris (19 August 2007). "U.S. says Iranians train Iraqi insurgents". McClatchy Newspapers. ↑ "A Dark Side to Iraq 'Awakening' Groups". International Herald Tribune. www.military.com. 4 January 2008. สืบค้นเมื่อ 22 April 2012. ↑ Miller, T. Christian (4 July 2007). "Private contractors outnumber U.S. troops in Iraq". Los Angeles Times. ↑ Roberts, Michelle (24 February 2007). "Contractor deaths add up in Iraq". Deseret Morning News. ↑ "Obama Looks at Adding Bases and Troops in Iraq, to Fight ISIS". The New York Times. สืบค้นเมื่อ June 12, 2015. ↑ "Operation IMPACT". สืบค้นเมื่อ 11 June 2015. ↑ Mustafa Habib. "Are Shiite Militias Growing More Powerful Than Iraqi Army?". Niqash. สืบค้นเมื่อ 11 June 2015. ↑ Beehner, Lionel (9 June 2005). "IRAQ: Militia Groups". Council on Foreign Relations. ↑ Los Angeles Times (9 October 2014). "Are Iraq's renowned peshmerga fighters any match for Islamic State?". latimes.com. สืบค้นเมื่อ 11 June 2015. ↑ "Outgunned and untested for years, Kurdish peshmerga struggle". Reuters UK. สืบค้นเมื่อ 11 June 2015. ↑ 74.0 74.1 "Iraq Government Casualty Figures via AFP (Google Docs)". Docs.google.com. สืบค้นเมื่อ 2014-07-31. ↑ "احصائية رسمية: 1997 العدد الكلي لمفقودي مجزرتي سبايكر وبادوش". Rudaw. สืบค้นเมื่อ 11 June 2015. ↑ "OPERATION INHERENT RESOLVE (OIR) U.S. CASUALTY STATUS" (PDF). defense.gov. 9 September 2015. ↑ "Documented civilian deaths from violence". Iraq Body Count database. Iraq Body Count. 2012-07-24. สืบค้นเมื่อ 2012-09-02. ↑ "Displacement in Iraq Exceeds 3.3 Million: IOM". ↑ 87.0 87.1 "Who Else, Besides Americans, Are Flying Fighter Jets in Iraq?". Slate Magazine. สืบค้นเมื่อ 14 November 2014. ↑ "Iran 'sent soldiers to fight in Iraq'". Al Jazeera America. 23 August 2014. สืบค้นเมื่อ 11 September 2014. หน้านี้แก้ไขล่าสุดเมื่อวันที่ 16 กันยายน 2561 เวลา 00:49 น.